Nearly 28,000 members of Canada's Army, Navy, and Air Force who have served in the First World War, the Second World War or the Korean Conflict went missing or have no known grave. 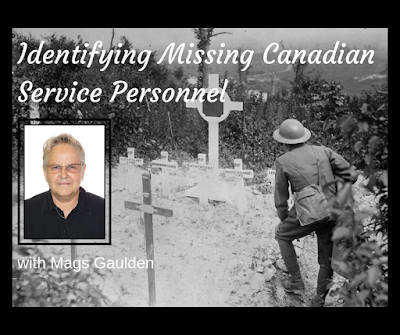 Mags Gaulden is a member of the Canadian Casualty Identification Team whose job it is to attempt to identify newly discovered human remains of military personnel who went missing during active service. She is a Professional Genealogist specializing in Genetic Genealogy as founder of Grandma’s Genes in Ottawa. Growing up in a family full of family historians, Mags was primed to become a Genealogist. After earning her Bachelors Degree from Columbia College, she began to work her own Genealogy as a “hobby”. This 30 year “hobby” eventually lead her to a Leader role with WikiTree, where she currently leads: the the DNA Project, the United Empire Loyalist Project, and the British Home Children Project. She also leads the Templeton and McElmoyle Name Studies and the McElmoyle DNA Project. Work with WikiTree led to Mags starting Grandma’s Genes in 2016. Mags is a Genetic Genealogy Lecturer, Blogger and a Social Media Maven. She serves as Admin for Facebook groups including the ISOGG FaceBook Group. Mags will by my guest this week on the webinar. Don't miss out on what is surely going to be a fascinating and heart-warming interview. REGISTER HERE to save your spot for this week's Genealogy with a Twist webinar.